Futures trading or commodity trading first started somewhere in the 18th century in Japan and in Holland. There is an extensive history of the development of the commodity futures contract, and the 21st century markets make use of the up-to-the-minute trading technology to the degree that considerably more trade is now done electronically. As per the newest definitions- Futures trading is more like a trading of contracts called futures contracts, which provides the holder with power to trade the basic commodity at somewhere in the future for a fixed rate. There are primarily two sorts of futures trading contracts on hand in a futures market as those entail a physical delivery and those require a cash settlement. The contracts that need a physical delivery are known as commodity futures and comprise futures for agricultural commodities like rice, wheat, sugar, oats; energy commodities like natural gas, crude oil, heating oil and others such as animals, wood etc. Futures contract that necessitate a cash settlement are called financial futures and entail treasury notes, bonds, mutual funds etc. Exposure to real assets can be attained through commodity futures trading on one of the numerous global commodity exchanges across the globe. When trading futures, you are mainly speculating on the market of a particular commodity and betting your investment in a way that you believe the market will sooner or later trend in the future. What is great about this kind of trading is that it's standing on tangible objects and therefore, the world of futures is set more on reality-based events than stock trading, which varies on more intangible possessions, such as the moods and emotions of investors. But doing with decisions and a range of trading methodologies out there can be a tricky job. Fortunately, there is a bounty of knowledgeable specialists or experts around the World Wide Web to assist you get a grip on how to appropriately use future contracts. 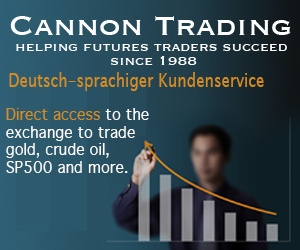 So, to give investors a leg up on these trading vehicles and for advice and analysis on fast paced investment, Cannon Trading (https://www.cannontrading.com), a Beverly Hills, CA based Online Commodity and Futures Trading firm (in the business for over 25 years), outlines the top 100 future trading blogs (in no particular order) from around the web. Take some advice from people who know what they're talking about! Cannon Trading will soon reveal the "Top 100 Options Trading Blogs" list… If you own an Options Trading Blog or you know an amazing option trading blog that must qualify the list, share with us on media@cannontrading.com.